For the island near Great Barrier Island, New Zealand, see Kaikoura Island. Kaikoura (/kaɪˈkɔːrə/; officially Kaikōura) is a town on the east coast of the South Island of New Zealand. It is located on State Highway 1, 180 km north of Christchurch. Kaikoura became the first local authority in the Southern Hemisphere to achieve recognition by the EarthCheck Community Standard. The town has an estimated permanent resident population of 2,150 (as of June 2018). The town is the governmental seat of the territorial authority of the Kaikoura District, which is politically a part of the Canterbury region. The infrastructure of Kaikoura was heavily damaged in the 2016 Kaikoura earthquake, which also caused two deaths in the area. The bay and surrounding region was uplifted by as much as 2 metres. From 1853 to 1876, Kaikoura was administrated as part of the Nelson Province. 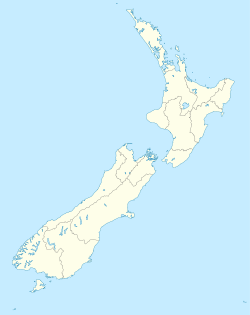 In 1876 the Kaikoura County was formed. On 14 November 2016 a 7.8-magnitude earthquake struck the South Island just after midnight. It left two people dead and triggered a small tsunami. One thousand tourists and hundreds of residents were stranded in Kaikoura after the earthquake cut off train and vehicle access. The Kaikoura Peninsula extends into the sea south of the town, and the resulting upwelling currents bring an abundance of marine life from the depths of the nearby Hikurangi Trench. The town owes its origin to this effect, since it developed as a centre for the whaling industry. The name Kaikōura means 'meal of crayfish' (kai – food/meal, kōura – crayfish) and the crayfish industry still plays a role in the economy of the region. However Kaikoura has now become a popular tourist destination, mainly for whale watching (the sperm whale watching is perhaps the best and most developed in the world) and swimming with or near dolphins. There is also a large and readily observed colony of southern fur seals at the eastern edge of the town. At low tide, better viewing of the seals can be had as the ocean gives way to a rocky base which is easily navigable by foot for quite some distance. It is also one of the best reasonably accessible places in the world to see open ocean seabirds such as albatrosses, petrels and shearwaters, including the Hutton's shearwater which nests high in Kaikoura mountains. A strategic plan for the future of the Kaikoura coast is being developed by Te Korowai o te Tai o Marokura, the Kaikoura Coastal Guardians. The town has a beautiful setting, as the Seaward Kaikoura mountains, a branch of the Southern Alps, come nearly to the sea at this point on the coast. Because of this, there are many walking tracks up and through the mountains. A common one for tourists is the Mt. Fyffe track, which winds up Mt. Fyffe, and gives a panoramic view of the Kaikoura peninsula from the summit. Mt. Fyffe owes its name to the first European family to settle in Kaikoura, the Fyffe family. The cottage that they lived in, built in 1842, still stands, and is now a tourist attraction operated by Heritage New Zealand. The construction of the cottage is unusual in that the supporting foundations of the house are made of whalebone. At the 2013 census, the largest employment industries in the Kaikoura District were accommodation and food services (19.5%), agriculture, forestry and fishing (17.7%) and retail trade (11.5%). Takahanga Marae, a marae (tribal meeting ground) of Ngāi Tahu and its Te Rūnanga o Kaikōura branch, is located in Kaikoura. It includes the Maru Kaitatea wharenui (meeting house). At a provincial level, the area of Kaikoura initially belonged to the Nelson Province. When the Marlborough Province split off from the Nelson Province, Kaikoura became part of that new province, with the Conway River the new southern boundary. Provincial government was abolished at the end of 1876, and counties were formed instead. Kaikoura was from 1877 governed by Kaikoura County. The county's boundary was adjusted northwards in 1940 to take over most of the East Coast Riding of Awatere County. There were also desires for land from Cheviot County to transfer to Kaikoura County, but the petition lapsed. In 1952, there were moves for a borough to be formed for Kaikoura township, but the underlying concerns from which the initiative resulted were addressed in different ways and no borough was formed. A 1971 scheme to form a Hurunui County would have seen Kaikoura County lose the area south of the Hundalee Hills, but this did not proceed. The 1989 local government reforms disestablished all counties, and district and regional councils were formed instead. Kaikoura District was formed in the process, with the land south of the Hundalee Hills transferred to Hurunui District as per the 1971 proposal. At a regional level, Kaikoura belonged to the Nelson-Marlborough Regional Council. When the regional council was disestablished in 1992 after only three years and its functions went to the unitary authorities of Nelson City Council, Tasman District Council, and Marlborough District Council, Kaikoura transferred to the Canterbury Regional Council. In 1993, an elector-initiated appeal wanted the northern 59% of Kaikoura District to be transferred to Marlborough District, but this was rejected by the Local Government Commission. There was a further elector-initiated proposal for Kaikoura District to merge with Hurunui District, but the Local Government Commission rejected this in 2009. In terms of its provincial anniversary holiday, Kaikoura observes the anniversary of Marlborough Province due to its historic association. This meant that the public holiday established through the Canterbury Earthquake Commemoration Day Act 2011 did not apply in Kaikoura District as it only applied to the area where the Canterbury Anniversary Day is observed. The town of Kaikoura was represented through an elected representative of the Amuri electorate on the Nelson Provincial Council. From 1860, the area was represented on the Marlborough Provincial Council first through the Flaxbourne and Clarence electorate, then the Clarence electorate, and finally the Awatere electorate. The town is on State Highway 1 and the northern section of the South Island Main Trunk Railway. Kaikoura also has a small sealed airstrip located 6 km south of the main centre. The Kaikoura Aerodrome is mainly used for whale spotting tourist flights but it can also be used by small private and charter flights. It previously had return flights to Wellington operated by Sounds Air. Kaikoura is served by the Main North Line, the northern section of the South Island Main Trunk Railway. The line opened north of Kaikoura on 13 March 1944, while the line south of the town opened on 15 December 1945, the latter completing the full line Christchurch to Picton. Kaikoura is served by the Coastal Pacific long-distance passenger train, formerly called the TranzCoastal, which connects the town with Christchurch to the south, Picton and the Cook Strait ferries to the north. Kaikoura Station was the last station in New Zealand to have a refreshment room for passengers, which closed in 1988 when the Coastal Pacific Express (former name for the TranzCoastal) introduced on-board refreshments. Freight trains also pass through the town, mainly carrying freight between the marshalling yards at Middleton in Christchurch and the Interislander rail ferries at Picton. The Main North Line (Picton to Christchurch, passing through Kaikoura) suffered damage in the November 2016 earthquake and was closed for repairs, re-opening to freight traffic on 15 September 2017. The Coastal Pacific is expected to resume running once all repairs are completed in mid 2018. Kaikoura has three locally transmitted radio stations on FM. These are More FM Marlborough (formerly Sounds FM) broadcast from Blenheim during the day and Auckland at night, Blue FM which is a locally broadcast Kaikoura station, and Tahu FM broadcast from Christchurch. Non local transmissions of the following stations can be received: The Breeze (Wellington AM/FM), Radio New Zealand National (Wellington AM/FM), ZM (Wellington and Christchurch FM), Radio Hauraki (Christchurch). Movies are shown at the Mayfair cinema (opened 1935), located on the Esplanade, and historically known for its carbon arc movie projector. In November 2013 the cinema went digital. Due to earthquake, it has closed. ^ "Green Globe". Kaikoura District Council. Archived from the original on 21 March 2008. Retrieved 14 March 2008. ^ "Hundreds of tourists stranded by New Zealand quake rescued by helicopter – World – CBC News". Cbc.ca. Retrieved 29 March 2017. ^ "Live updates following Monday's 7.8 earthquake: A picture of devastation". New Zealand Herald. 16 November 2016. ISSN 1170-0777. Retrieved 17 November 2016. ^ Kaikoura Coastal Marine Values and Uses A Characterisation Report. Te Korowai o Te Tai o Marokura (Kaikoura Coastal Marine Guardians). Second edition May 2008. ^ "Team Korowai – Te Korowai o Te Tai o Marokura – Kaikoura Coastal Guardians". Fishnet.co.nz. Retrieved 16 October 2012. ^ "Fyffe House at the New Zealand Historic Places Trust". Archived from the original on 1 April 2008. Retrieved 18 May 2008. ^ "Climate Data". NIWA. May 2011. Retrieved 2 November 2007. ^ McLintock, Alexander Hare, ed. (1966). Nelson Province and Provincial District. An Encyclopaedia of New Zealand. Retrieved 20 November 2017. ^ a b "Determination on proposal for the abolition of Kaikoura District and its inclusion in Hurunui District" (PDF). Local Government Commission. May 2009. Retrieved 20 November 2017. ^ "Kaikoura not taking day off". The Marlborough Express. 16 March 2011. Retrieved 27 June 2017. ^ "Geographical Mileage Table 1957" (PDF). New Zealand Railways. Retrieved 19 November 2016. ^ "Coastal Pacific". Retrieved 30 September 2017. ^ "Big plans afoot for Kaikoura's earthquake-damaged Mayfair Theatre". Stuff. Retrieved 30 September 2017. Wikimedia Commons has media related to Kaikoura. Wikivoyage has a travel guide for Kaikoura.